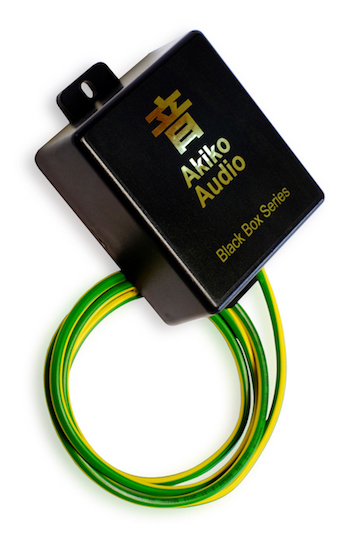 This unit is identical to the Harmonizer in the Akiko Audio Powerconditioner Corelli. We have experienced that adding an extra Harmonizer to the start of the power supply improves the results of the Corelli even more. The Corelli is supported by the extra Harmonizer unit in your meter cupboard; the improvement is clearly audible. A must for every Corelli owner! The Harmonizer comes with a meter long connection cable and should be placed besides the meter cupboard. 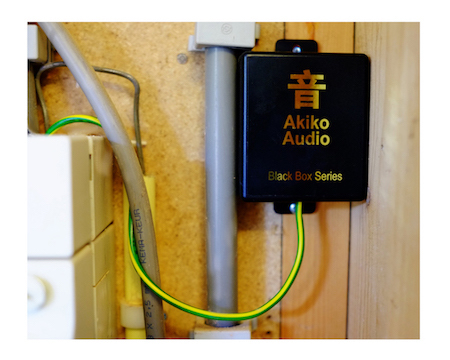 Preferably connect this green/yellow cable to the same rail on which the earthing for the separate power cable of your audio/video set-up is also connected. As this requires you to open the meter cupboard it is absolutely essential for your own safety that you switch off the electricity beforehand! Or let your electrician do this part. Shorten the connection cable if possible. Finally, mount the Harmonizer as close as possible to the meter cupboard using two self-tappers or screws. The great properties of the Corelli are amplified. Remarkable improvement of the voice rendering and rendering of acoustic instruments. Because high frequency noise is reduced, listening to music becomes more pleasant; listening fatigue doesn’t stand a chance. You listen deeper into the recording; because of the lower noise floor little details become audible. Enjoying your music becomes more emotional. Dimensions: 71mm x 61mm x 30mm. Connection cable: 1 meter long 2,5mm² grounding cable, colour coded green-yelllow. Supplied with clear installation instructions. Comes with 14 days ‘not satisfied-money back’ guarantee.